Experience matters when it comes to choosing a family law attorney to represent you. That's why we take great pride in the work we do at Courtney ∙ Clark Law, P.C. in Belleville, Illinois. We know what we're doing because we've been doing this work for decades. Collectively, our attorneys have nearly 40 years of experience. It's not just how long we've been doing this work which sets us apart. It's how we work that makes us effective, successful attorneys. We're especially well-known for effectively addressing the financial aspects of legal cases. We're deeply committed to every case we handle. We never take anything for granted. We're always prepared to do the work that needs to be done to do the job right. You can expect the same high standards when you hire us to handle your case. Founded by the late Stephen R. Clark and current principal and managing partner Charles W. Courtney, Jr. in 2000, our law firm remains committed to providing the best possible legal advice and exceptional service to every single client. 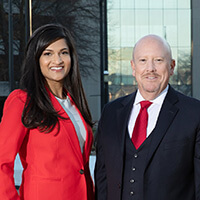 In addition to attorney Charles W. Courtney, Jr., attorney Jayni Desai Lintvedt and our talented legal team work together to develop the best possible strategy every legal case. While we have worked with many clients throughout the years, we never take a one-size-fits-all approach to legal cases. As your attorney, we will take the time to get to know you and develop a strategy that addresses your unique legal needs. We will then explain all your available legal options in plain, straightforward language you can understand. That way, you can make decisions about what you want us to do for you. We're not interested in just getting you to decide to hire us. We want to earn and keep your trust for years to come. That's why you can expect us to work tirelessly throughout your case. Every step of the way, we will keep you informed and consult with you about every important decision that needs to be made. Our approach produces positive results. It's also the reason why so many people give us favorable testimonials. Their recommendations - along with referrals from many fellow attorneys and professionals in our legal community - inspire us to work harder every single day. We never take anything for granted - and that includes your trust. Discover what a dedicated family law attorney can do for you. Contact us and schedule your free case evaluation today at our Belleville, IL law firm. We're here for you when you need us most.